Seventeen-year-old Flora Banks has no short-term memory. Her mind resets itself several times a day, and has since the age of ten, when the tumor that was removed from Flora's brain took with it her ability to make new memories. That is, until she kisses Drake, her best friend's boyfriend, the night before he leaves town. Miraculously, this one memory breaks through Flora's fractured mind, and sticks. 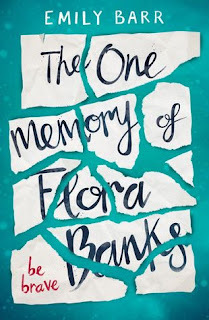 Flora is convinced that Drake is responsible for restoring her memory and making her whole again. So when an encouraging email from Drake suggests she meet him on the other side of the world, Flora knows with certainty that this is the first step toward reclaiming her life. With little more than the words "be brave" inked into her skin, and written reminders of who she is and why her memory is so limited, Flora sets off on an impossible journey to Svalbard, Norway, the land of the midnight sun, determined to find Drake. But from the moment she arrives in the arctic, nothing is quite as it seems, and Flora must "be brave" if she is ever to learn the truth about herself, and to make it safely home. I enjoyed Flora Banks on the whole. It's one of those books which is hard to review without spoiling because of the nature of the story. The main character is such an unreliable narrator and and the story keeps you guessing all the way through. It is quite slow in places but I found that those bits made much more sense once you got to the end of the book. If you enjoy a thriller or a story with lots of twists you enjoy this.